I wish the rock weren't cropped at all. Just a bit lower would've helped. Still a great shot, love the tones. Very interesting photo. 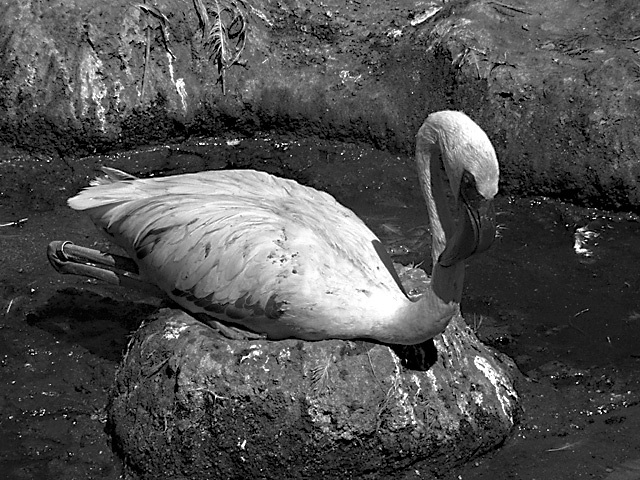 Any reason it's not in color - given the natural coloring of the bird against the mud? I'm thinking the mud color was probably not rich enough. Just curious. Anyway, I like the picture very much and had no prior idea about where flamingos nested. Good lighting, B/W is ok. I think this shot could be better if it was in color. Proudly hosted by Sargasso Networks. Current Server Time: 04/26/2019 03:41:17 AM EDT.